This car has been my daily driver on and off for nearly 20 years. 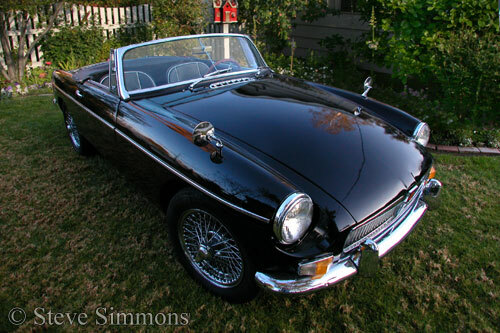 Originally purchased by my grandfather in 1966, this MGB was passed on to my father in the 1970’s. My young siblings and I nicknamed it “The Flying Raisin” because it was small, black, wrinkled (from dents) and it “flew”. For my 16th birthday my father reluctantly gave into my nagging and gave me the car which was now falling apart from age and well over 200,000 miles of daily driving. I partially restored the car and put many, many more miles on it. The MGB now has well over 300,000 miles on the clock and still puts a smile on my face every day! Who says you can’t look forward to your commute to work? Some of the early work I did on the car while in my teens. This work included many low-budget items like plastic zip ties and two-sided tape. How we planned to get married with the car, then forgot, then remembered right before the wedding. Plus how I did a “fool ’em from ten yards” restoration in under two weeks. A few general photos I took shortly after the wedding project. Being a purist at heart, it took nearly 20 years of ownership to finally push the performance of this car a bit higher. The idea of the project was to create something that could have been done in the period when the car was new. Of course period performance parts such as superchargers are very hard to come by, so I used modern reproductions where necessary. A few items are not really period – roller rockers for example. In this case it was far cheaper and more simple to use these than to make a custom set of high lift rockers, which a supercharged engine really needs. I have always been committed to keeping all of the mods performed on this car completely reversible. Not so much as a hole will ever be drilled where it should not be. I believe in making a car what you want it to be but also in preserving vintage machinery for future generations to enjoy. I also enjoy the experience of driving a real vintage automobile, not a heavily modified and modernized one.